The Columbia-Lafayette Neighborhood that we are saving from being bulldozed, should we call it "Co-La-Fa", or "CoLa-Fay", or "ComLum-Fa", or simply "CoLa", or maybe something else? 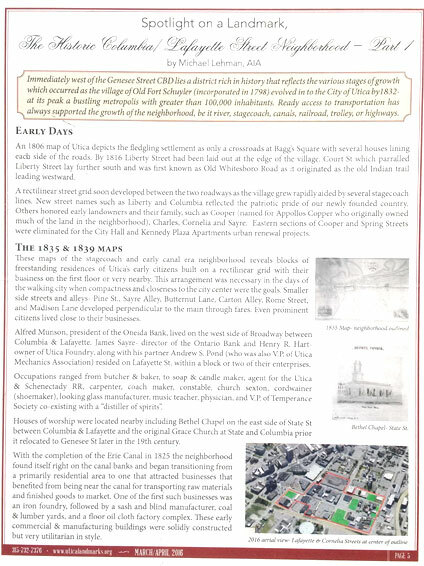 A claim made in the Region's MV500 Effort (PDF) called the targeted hospital zone in Downtown Utica as "34 acres of a largely vacant, underutilized and functionally obsolete area"
Below you may read a detailed account of this neighborhood as documented by our Landmark's Society. Let's turn away the Government's Urban Renewal-style Concept For A Downtown Hospital & 34-acre Hospital District. Instead, let's restore some of the past as a new, walkable and desirable place to live, is promoted! Large-scale, multi -block demolition of a significant segment of the downtown area, unseen since the era of "Urban Renewal” of the 1950s and 60s, destroys the fabric, character and sense of place that defines the uniqueness of what makes Utica what it is. While some of the existing buildings have certainly lost character and charm, many others remain a wonderful testament to the historicity of the city. In fill buildings that erase the gaps between existing structures can be built that complement the size and scale of their neighbors and create a pleasant, cohesive and very livable community. As Utica continues to experience the long awaited rebirth, revitalization and Renaissance, the buildings that would be lost represent a lost opportunity for small scale structures where ground floor commercial uses would complement upper floor residential uses in a walkable, urban setting. This is in keeping with smart growth Principles, and with the tenets of the National Trust of Historic Places that espouses that smaller, older, and more walkable is better. Planners must consider the highest and best use of the buildings. Let's build upon the rich and fruitful successes realized in Bagg's Square. Furthermore, these buildings would remain on the tax rolls. Given that this section of the city was once part of Utica's industrial past, there is a potential for what could be described as a 19th century "brownfield" lurking beneath the existing structures that would need to be remediated, adding significantly to the ultimate project cost. Remember, the former Erie Canal was used as a dumping ground after it was abandoned. Among the most significant issues of concern to relocation of the consolidated hospitals into one downtown site is the proximity of this site to the CSX mainline railroad tracks (within approximately 1500 feet). Given the increased shipment of potentially hazardous freight on the rail lines, not the least of which includes crude oil trains, if it were necessary to evacuate a section of the city due to a derailment, the triage center would be the hospital; however, the hospital could potentially be within the evacuation zone, creating a potential compound disaster. What few plans and concepts that have been shared for a downtown hospital location are reminiscent of Robert Moses in size and scale, a huge, iconic structure surrounded by a sea a parking. This would be the antithesis of what makes Utica unique. The St. Luke's site is not entirely perfect, but it is certainly far more suitable for this type of plan. It is already a campus. It is adjacent to Utica College that has an established medical curricula that could be expanded. It has room for expansion. It is easily accessible from Route 8/12 and sufficiently distant from the CSX railroad mainline. A new structure could be built in the parking areas adjacent to the existing hospital, the existing hospital could then be demolished (if that is what must happen) and parking structures could be added in the available space. Demolition would be relatively minimal compared to the downtown alternative. Ultimately, there is a real need for public input and discussion on this process as it potentially affects all of us. We can all "agree to disagree;' but we will all have to live with the end results for a long time to come, and everyone needs to be heard on an issue of the importance and significance of this one. Please act today, place a call(s) to your government representative(s), and or sign our petition at a meeting listed below. Find us on Facebook as well.